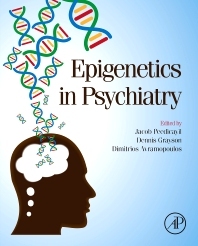 Epigenetics in Psychiatry covers all major areas of psychiatry in which extensive epigenetic research has been performed, fully encompassing a diverse and maturing field, including drug addiction, bipolar disorder, epidemiology, cognitive disorders, and the uses of putative epigenetic-based psychotropic drugs. Uniquely, each chapter correlates epigenetics with relevant advances across genomics, transcriptomics, and proteomics. The book acts as a catalyst for further research in this potentially very important and useful area of psychiatry. The elucidation of basic principles of epigenetic biology points to the creation of more optimal and effective therapies for major classes of psychiatric disease. In this regard, epigenetic therapy, the use of drugs to correct epigenetic defects, may help in the pharmacotherapy of patients with these disorders. With time, such advances may eventually point to replacements for psychotropic drugs presently of symptomatic value and low efficacy. Moreover, there is evidence to suggest that other forms of treatment commonly used in the management of psychiatric disorders, like psychotherapy and electroconvulsive therapy, may also act by epigenetic mechanisms. This work is aimed at biomedical researchers of graduate level and above who are seeking to elucidate the epigenetic basis of psychiatric disorders. These researchers typically fall within biological psychiatry, neuroscience, epigenetics, molecular biology, and geneticists working on psychiatric disease. How do epigenetic modifications contribute to diversity? Can drugs be developed for NDDs based on epigenetics?